For a big trade show like NAB Las Vegas, or Broadcast Asia in Singapore, the often-quoted truism is that the planning next year’s show begins the day after the current year’s show ends. And – that’s certainly the case for Vegas and Singapore – two of the biggest shows that we attend each year. Back in April, as NAB approached, we were patting ourselves on the back that we were well advanced with our planning for Broadcast Asia (June 18 thru 21). But during NAB, something happened that caused a big re-think. Quite simply, we were so impressed with our NAB booth (particularly the layout and the lighting) that we decided to scrap everything we had already agreed upon for Broadcast Asia and go back to the drawing board. While we don’t have quite the same amount of space in Singapore that we have in Las Vegas, we decided to try to emulate our Vegas layout as much as possible – and we also decided to emulate the lighting effects that drew so much praise at NAB. So we went back to the six different exhibition designers that had been pitching for our business with a brand new brief and we were fortunate that most of them came up with great proposals that matched – and even exceeded – our requirements. By now we were right down to the wire to meet the deadlines for lodging our plans with the show organizers, but thanks to our great marketing and graphics staff in the United States, and our guys on the ground in South East Asia, we made it. Well, we made it on paper, at least! Now all we have to do is … do it for real. 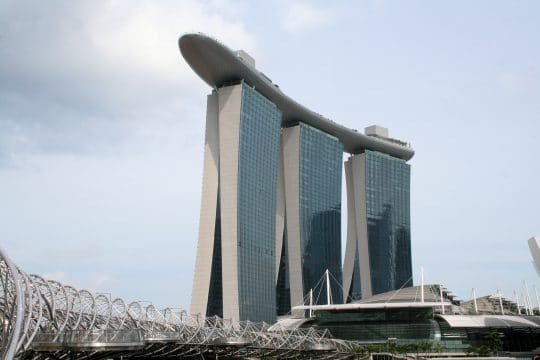 This year’s Broadcast Asia is being held at the truly magnificent Marina Bay Sands complex – one of the most futuristic and striking architectural achievements in the world. RCS will be showing its 21st Century product suite – we’re still one of the very few companies which can claim that every line of code in its core products (Zetta, GSelector, Aquira) was written in this century, rather than the last century! It is appropriate that in this futuristic city, some of the world’s great radio stations are either already on air with Zetta, or planning to join the Z revolution. As well as constant demonstrations of our core products, for the third year running, our special “Z Team” will be demonstrating our fantastic mobile and online products such as Zetta2Go and Selector2Go. Singapore is a great city and Broadcast Asia is one of the radio industry’s best trade shows; come and see us if you can. Among the languages spoken fluently by our staff at Broadcast Asia will be: English, Chinese, Thai … and Australian!